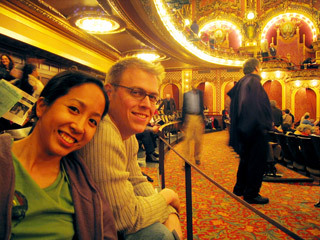 Brian and I went to our second opera last night (the first being Carmina Burana back when I was still in NYC), the fantastical Die Zauberflote (The Magic Flute) by my favorite composer, Wolfgang Amadeus Mozart, at the Cutler Majestic Theatre in Boston. It's also our second time celebrating the composer's 250th anniversary of his birthday. 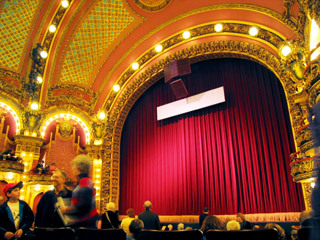 We had also gone to a concert at Symphony Hall during the week of Valentine's, eating dinner at a wonderful noodle diner nearby that had the quirkiest and most enjoyable music...think stuff like the theme to the Muppet Show, Welcome Back Kotter, disco, and jazzed up oldies. it was performed by the Teatro Lirico D'Europa and sung in German with English subtitles. Although the theatre was surprisingly small, we sat far enough from the stage that looking up at the subtitles wasn't so bad, but sat quite close to the stage, compared to previous staged performances we've gone to, that it was refreshing to actually see the actors' faces without squinting. Anyone see that Seinfeld episode where they go see Pagliacci, and Jerry and George argue about getting dressed up in tuxes? Well, I would have liked to get a little dressed up, but waiting for the 66 bus for more than 30 minutes to go home from the gym didn't quite allow ample time to change. So, I ended up wearing what I was wearing which included my All-Stars sneakers. I did feel very comfortable, although I stood out a bit next to a more dressed up theatre crowd. We both enjoyed the performance so much that we left the theatre singing, well...not so much singing, but at least trying to imitate the songs...on our way to dinner, during dinner and on our way back home. Nothing like seeing and hearing it live. The Queen of the Night was flawless (not that I'm much of a critic) and Papagena, who also played one of the Three Ladies, had a strong and beautiful voice among the other singers. But our favorite was Papageno, who not only had a wonderful voice but a great stage presence as well, being quite the comedian in the story. With Amadeus being one of my favorite movies, we had to pop the DVD in and watch The Magic Flute scenes, which we just finished watching. I definitely credit the movie to my love of the composer. If you get a chance to see any opera, I would highly recommend seeing this.